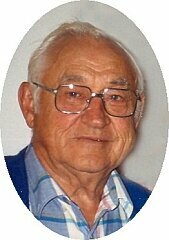 Donald Ray Wyborny was born March 28, 1918 to Edward and Lulu Witham Wyborny near Mason City, Iowa. On July 16, 1941 he married Lucile Nelson at Plymouth, Iowa. He farmed, operated an implement shop and the last fifteen years before retirement was service manager and pilot for Hagie Manufacturing of Clarion, Iowa. He was an avid fisherman and gardener. His family was very important to him. He passed away at the Hospice House in Mountain Home, Arkansas on March 8, 2007 just short of his 89th birthday. Donald is survived by his wife, Lucile, of Mountain Home; two daughters, Virginia Blakely of Mountain Home and Ronda Condie and husband Tom of Wellsville, Utah; one son, Paul Wyborny of Hodgen, Oklahoma; eight grandchildren and 9 great grandchildren; one brother, A. Kenneth Wyborny and wife Edna of Houston, Texas. Donald was preceded in Death by his parents, four brothers and four sisters-in-law. A guest book can be signed and messages left at www.kirbyandfamily.com.